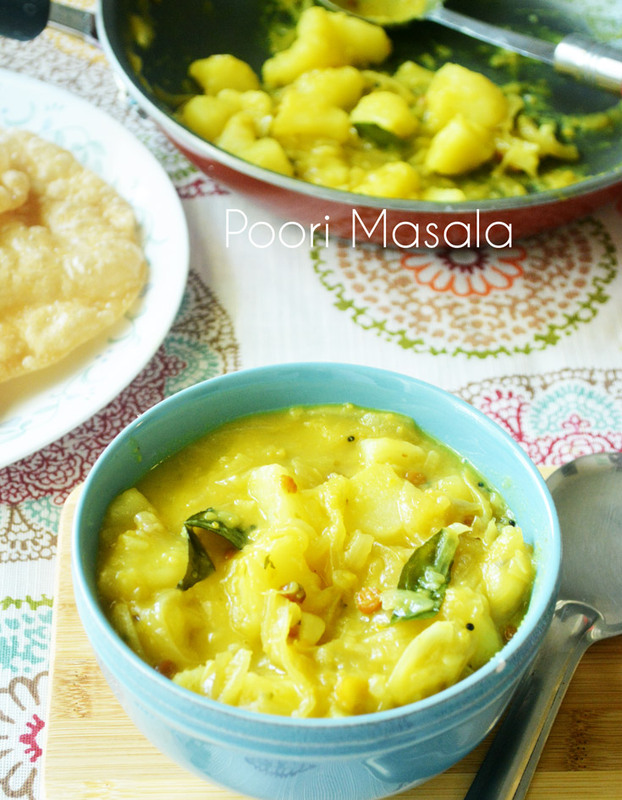 Potato masala with poori is many south Indians (Tamil) favorite breakfast. It's my hubby's favorite too. 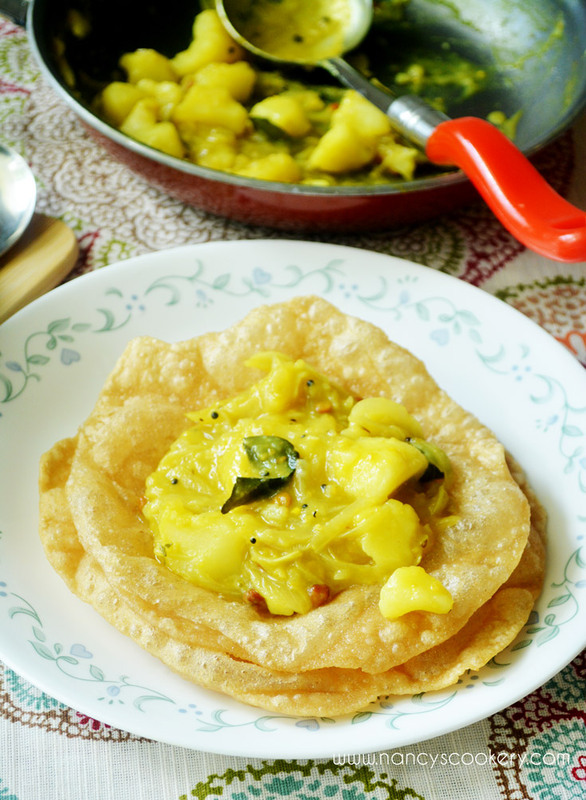 When we got married, I do not make potato masala for poori. We simply eat it with karakulambu which is prepared for that day's lunch. 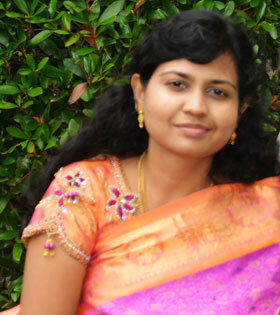 When my little boy started eating solid foods, I ventured into authentic south Indian recipes to show my boy our delicious Indian foods that he should not miss them. 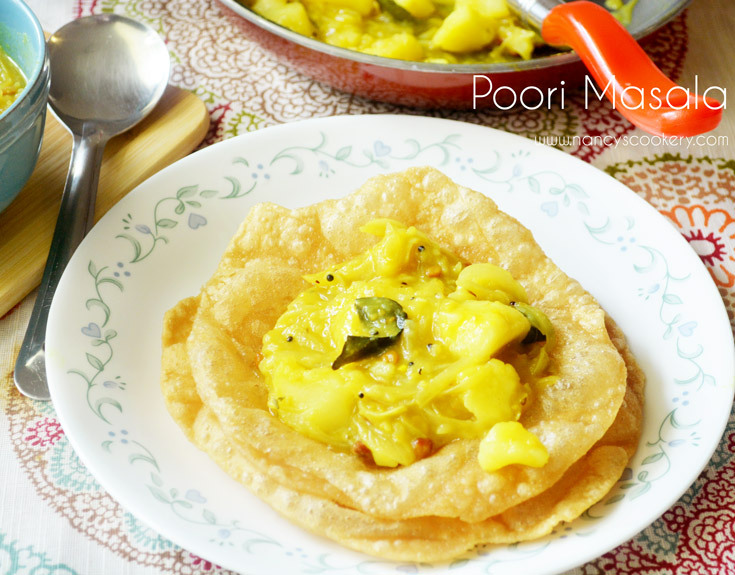 So nowadays I am making this poori masala whether my son eats or not me and hubby enjoy this yummy breakfast which is soul satisfying(for hubby :-)). I am sharing this recipe with you. It contains a secret ingredient which gives the taste of it as of hotel style and no harm to health which is also very good for health. Scroll down to see the recipe and it's secret ingredient. Happy cooking :-). 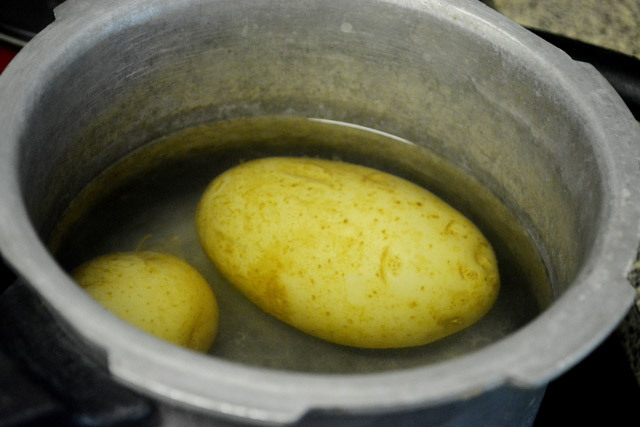 Boil the potatoes, peel the skin when cooled and crush them to medium pieces. 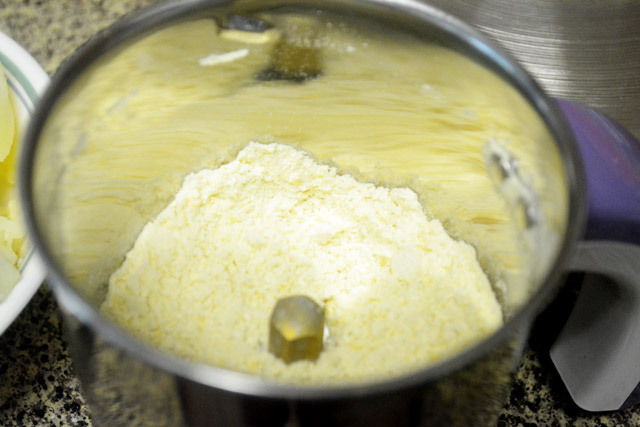 (Don't mash it fully, let it have pieces t bite.). Add salt and water(if necessary/ if the gravy is too thick), cook it in medium flame for 5 to 10 minutes. Switch off the heat. Boil the potato in whichever way you used to do. I pressure cooked the potatoes for 3 whistles in high flame. The big one didn't boil well, that's not a problem since we are cooking the potato at the end of preparation for 5 minutes. So it will get cooked at that time. 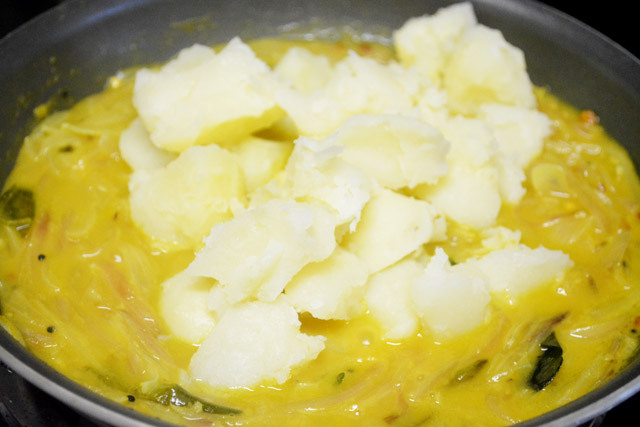 Once the potatoes are cooled, peel the skin and crush the potatoes into small bite sized pieces. Don't mash it completely. o it either with hand or spoon. Heat oil in a pan. Saute mustard seeds. 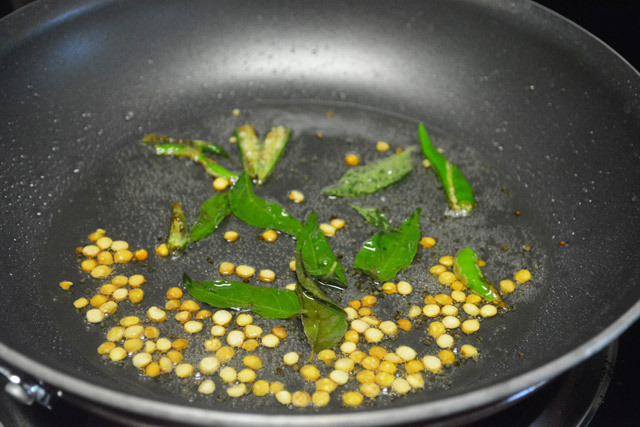 When the mustard splatters reduce heat and add channa dal and when the channa dal turns slight brown throw the curry leaves and green chilly. 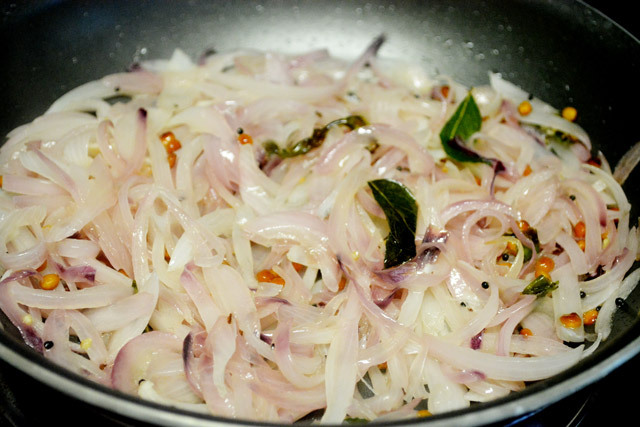 Now put the sliced onions and saute till the onions are translucent, this takes a while. To speed up the process throw some salt, say 2 generous pinches. 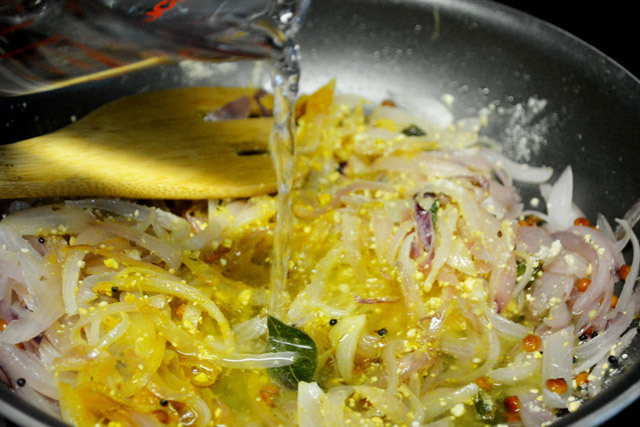 The adding of salt helps onion to ooze out water quickly and thus they become translucent fast. In the meantime, throw roasted gram/porikadalai/pottukadalai to a blender/food processor jar. Turn the heat to of the cooking onion medium. 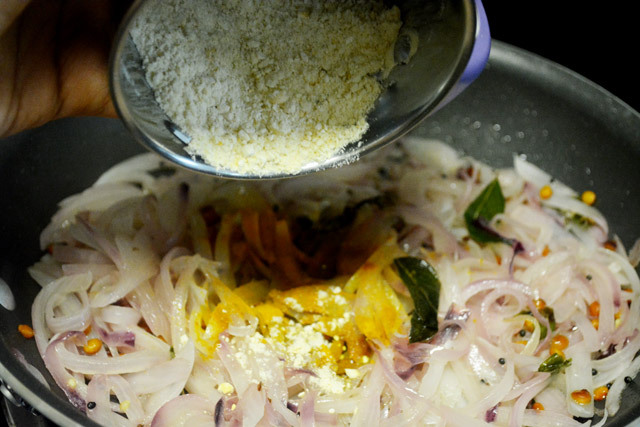 Powder the roasted gram/porikadalai/pottukadalai, if it contains tiny bit pieces don't worry it will get cooked. Now the onion has become translucent fast with little salt trick. 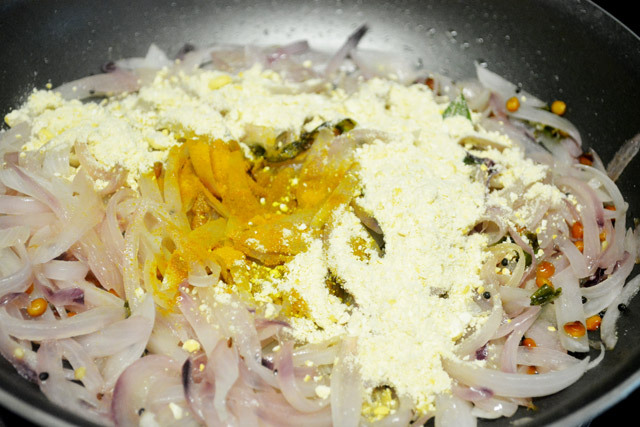 Now add the turmeric and the powdered roasted gram/porikadalai/pottukadalai. 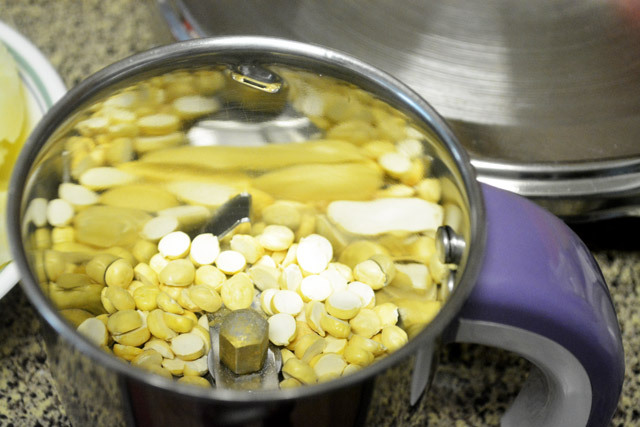 The roasted gram/porikadalai/pottukadalai is the secret ingredient in the poori masala which gives the taste of hotel style and also thickens the poori masala. 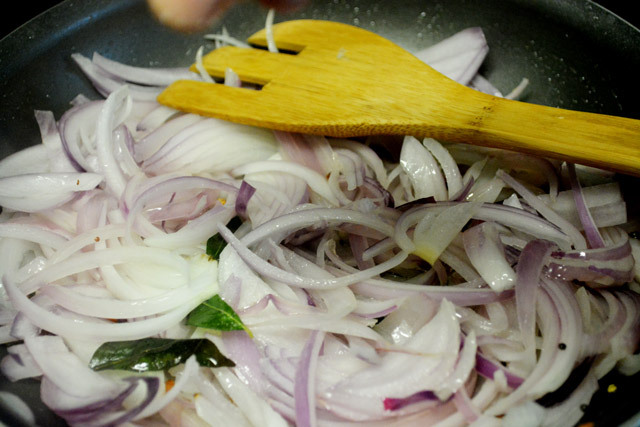 Now pour the water to the onion mixture. At this point use 1.5 cups of water and cook the onions. The onions are cooked well now. 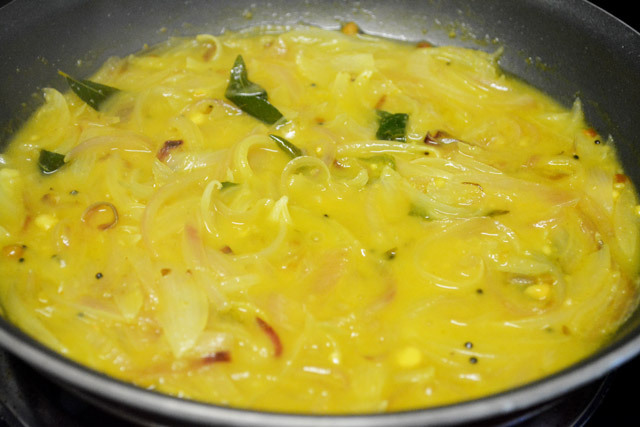 Put the crushed potato to the onion mixture and add remaining water, mix it check the consistency and add water if the masala is too thick. Put the salt also and stir it well. 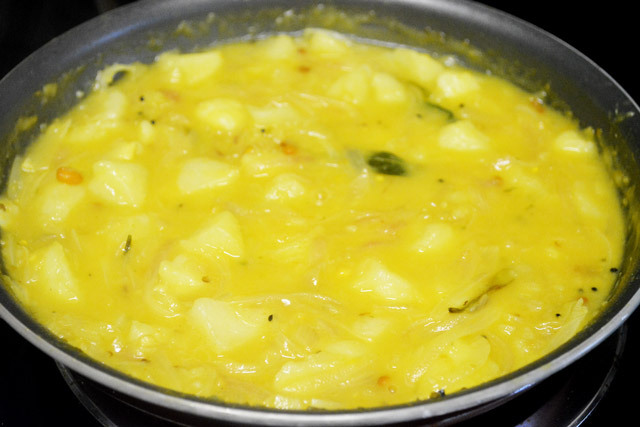 Cook the potato masala for 5 to 10 minutes in medium to low heat, then turn off the heat. 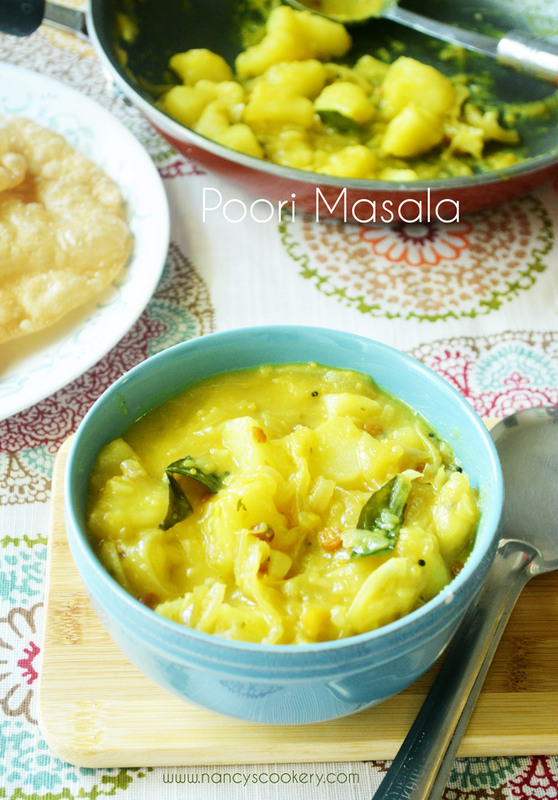 Serve the potato masala hot with poori. This is how we will be served in hotel and I like the poori when it's absorbed with poori masala. Tasted yummy.